The migration formation of the rabbit scooters, each scooter containing 2-5 rabbits. We got the rabbits put into their scooters for pasturing yesterday. Almost all of the males went into the tractors grouped by size. The only exceptions are the males that we are saving for breeding stock. The females stayed in the hutches for now. We’ll select breeding stock from them as well, and the remaining rabbits will be sold for food or pets. Most of the females were separated so that only 1 or 2 is in each pen. All of the rabbits are maturing and beginning to fight a little bit, so hopefully this will minimize the fighting. 1. It puts the pens close together without the sides rubbing (means repairs don’t have to happen as often). 2. The pens are as close as possible to each other while still leaving space to maneuver around them. 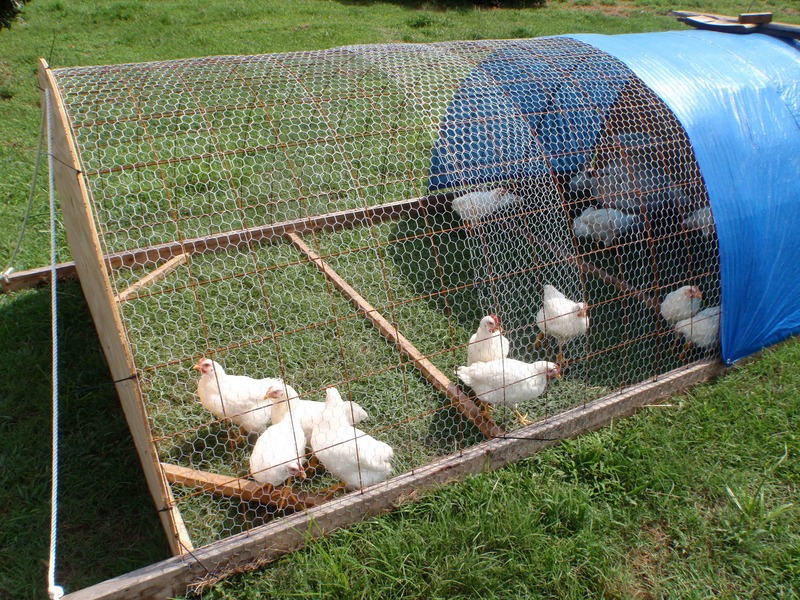 This means that you can service each cage efficiently in a small area without tripping over them. 3. If there is a slope to the land that the pens are on, staggering the scooters like this keeps poopy runoff from inundating the downhill pens during rainstorms. 4. You can run the pens without leaving “space” between the sides so that all of the pasture gets the nitrogen deposits left by the animals. If you put the cages in a straight line side-by-side, you have to leave room to walk between them in order to service the cages. This means there is grass that doesn’t get eaten and pasture that doesn’t get manure. Soon, you have a striped field. The inside of a loaded rabbit scooter. 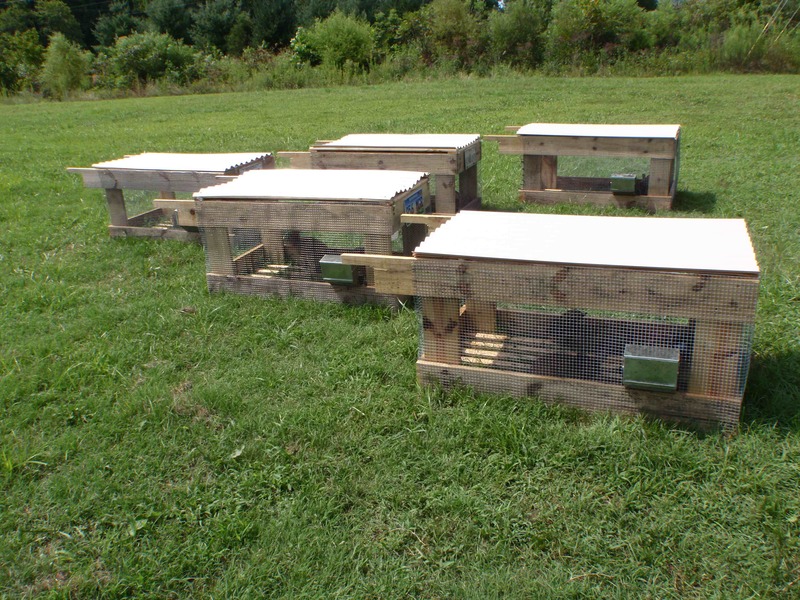 The 2x2s at the bottom run parallel to the way the scooter is pulled so that the grass stands up for the rabbits. As you can see, the rabbits have plenty of room. Additionally, since they eat a TON of grass, we’re moving them 3 times per day. Though that seems like a lot, it’s really only 1 extra trip out to the area because the other animals necessitate trips out to the pasture in the morning and evening. So I just go out there once more before lunch and move the rabbit scooters one length to fresh grass. This seems to be worth the trouble, because they reduced their pellet consumption by at least half yesterday and today so far. I’ll get solid before and after numbers for comparison and share them once they’ve been on pasture for a while longer, but that amounts to a $12 savings per week if that trend continues. So if rabbit is this healthy to begin with, why pasture them? Well, we believe that the compounds found in fresh green plants add vitamins and minerals (CLAs, carotenes, etc) that simply can’t be created in the meat any other way. There are lots of studies that have been done on beef and poultry to verify the added health benefits. I’d be really interested in seeing actual data comparing pastured rabbit to conventional rabbit, but I haven’t seen any such study anywhere. As a science teacher, I would make the hypothesis that if pasturing beef and poultry increases the nutritional level of the meat, then pasturing rabbits would also increase the nutritional level of the rabbit meat. There are other producers in Virginia and Tennessee that I know of who offer “pastured” rabbit. However, they bring the pasture to the rabbit in the form of green-chopped materials. I feel that this is more labor than moving a few rabbit pens. Plus, having the rabbit scooters means that the fertility from the rabbit manure is placed directly on the soil without me having to haul it or compost it. Second, and more importantly for us, the rabbit scooters allow the rabbit to act more like a rabbit, hopping around on the pasture, eating a variety of fresh grasses that change three times per day, and selecting what grasses they eat themselves. So hopefully this system will work out. 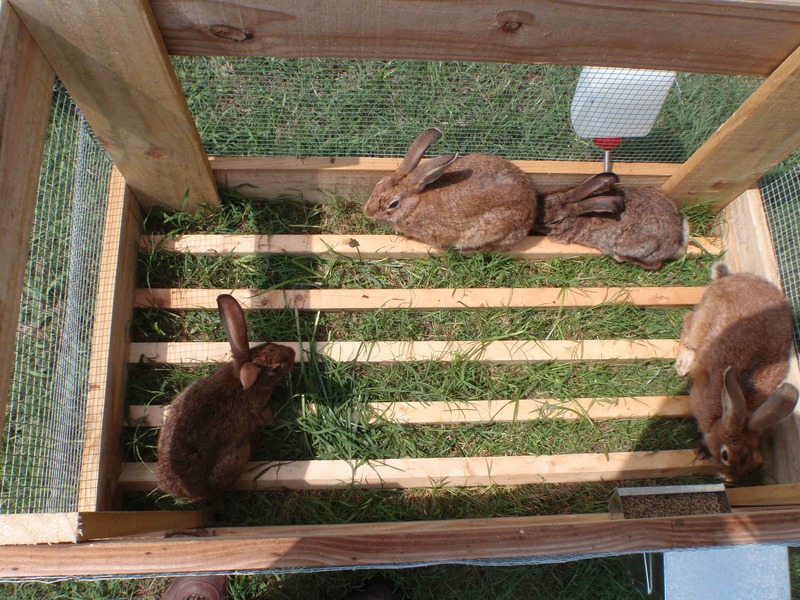 If anyone reading this knows of advantages rabbit hutches have over the scooters (other than reduced labor for the keeper), please contribute a comment and let us know! Other news from the poultry department (the USDA considers rabbit as “poultry” for regulatory purposes) is that the turkeys are starting to really act like turkeys. They range far more widely than the chickens or the guinea fowl and eat lots of grass, seed heads, and insects of all kinds. Watching them try to catch grasshoppers is extremely entertaining. They are gobbling a lot more often now, and are losing most of the feathers on their heads and necks. 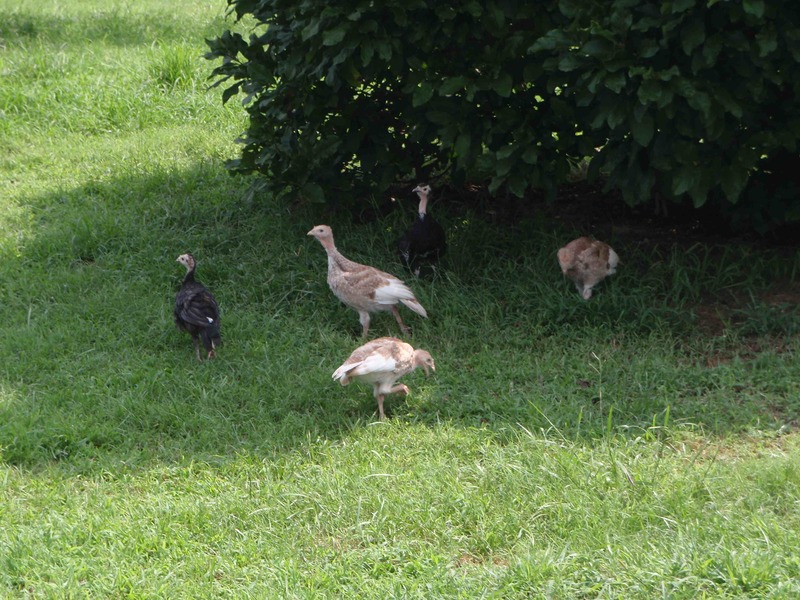 The turkeys are growing quickly and spend the day free-ranging. They explore the farm and "gobble" up lots of grass and insects. The laying hens are doing a great job making compost for us underneath the rabbit hutches that are still occupied. They are great labor-savers. All I do is throw down some wood chips or straw on top of the rabbit manure and the chickens go to town on it, scratching through it looking for grubs, worms, and fly larvae. In a couple days, I throw down some more carbon and they repeat. Once it builds up in volume, I’ll haul it off to the gardens. The broilers are in their last week on pasture. Next week is taste testing! The broilers are almost ready for processing. They go on Monday morning at 7:30. Shhh – they don’t know this. They are pretty large. I got a little scale yesterday, so once it quits raining and the birds and rabbits dry off I’m going to go weigh some so we have an idea of how much chicken and rabbit we have in terms of poundage so that we can price things accurately. I want to make sure we set a price that covers our expenses and pays us a decent wage per hour from the start so that we don’t have to have a price hike too soon and chase away our hard-earned customers.